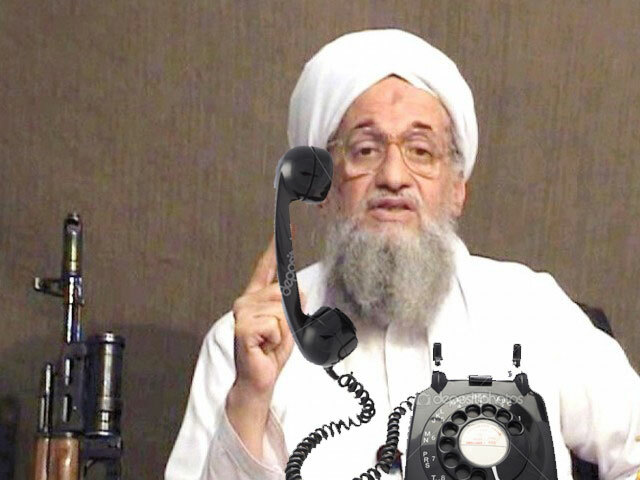 Thanks to our sources in the US State Department, we have obtained the transcript of the al-Qaeda telephone call that sparked temporary US embassy closures in the Middle East and worldwide travel warnings. The conversation between al-Qaeda global leader Ayman al-Zawahiri and Nasir al-Wuhayshi, the head of Al Qaeda in the Arabian Peninsula (AQAP) makes it clear why the US had no option but to raise the terrorist threat level to its highest code. AZ: Assalamu Alaykom brother Nasir. NW: Assalamy Alaykon. Who’s speaking? AZ: I’m the big uncle. NW: The big uncle? What big uncle? Uncle Salem? AZ: No, not the uncle from your family. The uncle from the other thing. NW: What other thing? Is this a prank call? AZ: No, brother Nasir, I’m the uncle whose name rhymes with ‘dayman’. NW: I told you people not to call me for these quizzes any more. I already have a washing machine. AZ: La hawla wa la quwata ila bilah. Brother Nasir, concentrate. You know me very well. From those geological expeditions in the caves in south Asia? NW: This is becoming more mysterious. Your voice sounds familiar, but this connection is very bad. AZ: Oh, curse the devil, I’m al-Zawahiri. NW: Ah, brother Ayman, forgive me, it’s Ramadan in the summer. How are you brother? This line is very bad, did you not upgrade your old Nokia? AZ: Never mind that, I want to talk to you about something important. NW: I really can’t hear you. Can you move closer to a window? AZ: There are no bloody windows here! Where do you think I am, the Hilton? NW: The Hilton? Have we agreed on that? AZ: No, no. It’s just an expression. NW: Oh yes, I get you; it’s not the Hilton, definitely not. Wink, wink. AZ: No, I’m serious, it’s not the Hilton. NW: I know, I know, I don’t even know what the Hilton means. Are you still having that iftar on Sunday the 26th of Ramadan? AZ: What iftar brother Nasir? NW: You know the big one at the Hilton? AZ: I told you it’s not the Hilton! Are you even listening to me? NW: But Hilton is our code word for you know what. The other thing. AZ: Brother Nasir, this is a personal call, not a professional one. Stop getting carried away. Nothing is happening at the Hilton. NW: I hear you. Is it the Hilton in Sana’a or Riyadh? AZ: Again with the Hilton. Ya Nasir, you are going to set warning lights all over the world with this foolish talk. You know that all calls are monitored these days. Be careful what you are saying. Who knows how they will react? You know how any small thing can make them totally freak out….. Oh, hang on a minute, I just thought of something. This will be fun. Yes, yes, of course, the iftar is going ahead at the Hilton this Sunday. Sunday 26 Ramadan which is 4 August in the infidel calendar. But I will tell you which branch later. NW: I’m completely confused now. If you prefer an unfunny version of this article, Dan Amira at New York Magazine has written one, a day after this post was written: Exclusive Transcript of Al Qaeda’s Worldwide Conference Call. Dan struggles to understand the basics of satire, but encourage him by reading his post and commend him on his efforts to strip it of all traces of humour. Remember, New York magazine is to New Yorker what Adibas is to Adidas. Hey Karl, seems this guy got inspired by your post, but fails to mention it. Anyways your post is smarter and funnier. Thank you. We noticed and told him and he completely denied it, saying the idea, the title and the photo were all coincidences! He refused to acknowledge it. I'm more worried about how unfunny he made it. Do some basic research before you accuse someone of plagiarism. who said plagiarism? The photograph, the title, the idea, and some of the lines, they're all just a coincidence. Shame that all experience of doing transcripts hasn't made them any funnier.